The furniture that started it all. You work hard. Find an office chair that works just as hard for you. Keep your employees comfortable and productive in high-quality office chairs from BizChair. Browse a range of styles, designs and features to find the best office chairs for your work environment. Having a hard time choosing the right office chair for you? We have narrowed it down to show the most popular styles and colors. Looking for a new office chair? Office chairs come in so many different shapes, styles and colors; sometimes it's hard to know where to begin. Add a personalized touch or a company logo to your office chair. We do all customization in-house so you receive the highest quality and quickest turnaround. Our office chairs come in a variety of sizes and styles to fit all types of work areas. For management positions, shop our collection of executive chairs. These chairs are crafted with either traditional leather or modern mesh materials and feature a high back to keep your staff comfortable and supported while they work. Within our selection, we also offer office chairs that can be personalized to include your company’s name and logo. Promote a healthy work environment by providing your team with seating alternatives that support better blood circulation and breathing throughout the workday. 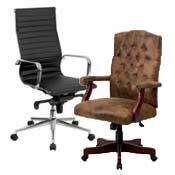 Our collection of office chairs includes mobile ergonomic kneeling chairs to maximize health and comfort. Many options are dual purpose to transition seamlessly between a kneeling chair and a backless stool, giving your staff more ways to feel comfortable while they’re on the job. For job sites that require longer hours for some staff or round-the-clock work in multiple shifts, browse our assortment of 24/7 intensive use chairs. 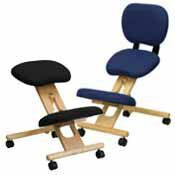 These chairs can help prevent back pain, headaches and muscle stiffness while your employees put in overtime. Look for heavy-duty features like high weight capacities, easy swivel capabilities and multi-function ergonomic designs to help your team function more effectively while they work. While the traditional swivel chair is a staple for any office, BizChair also helps fulfill your other seating needs. We offer a range of task chairs for casual or temporary workspaces such as conference rooms, shared work desks and more. 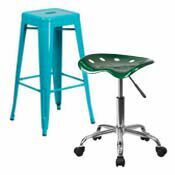 Office stools are available to finish out the break room or co-working bars. 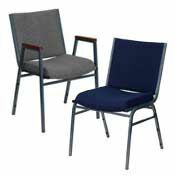 We also carry a range of office chairs for places outside the standard 9 to 5 office, including medical offices and places where kids can do homework. Work in architecture, graphic design or other creative industry? Our drafting stools provide exceptional back and arm support while featuring precise adjustment mechanisms to get the exact tilt and force you prefer. After you’ve found the best office chairs for your building, browse our array of other seating options to complete every room. 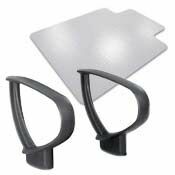 Reception seating, side chairs and other office essentials like ergonomic cushions and footrests are available to help you provide a range of seating solutions to your employees and customers. BizChair is committed to providing exceptional quality paired with the industry’s best customer service. Enjoy free shipping on office chairs that are delivered within the continental U.S. Because we keep our inventory well stocked, most orders can be shipped the next business day. Shop online now to find the best chairs for your office space.